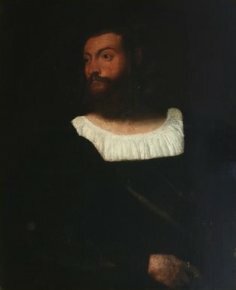 An unknown Titian sold at auction in Leicestirshire ? 21/07/2007 — Discovery — United Kingdom, Art market — On Thursday, July 10 in Market Harborough, Leicestershire, Gilding’s, a small auction house, listed a painting described as dating from the XVIIIth C. and estimated at £300 to £500. It totalled a gavel price of £205.000. It seems that the Portrait of a Man (ill.) is nothing less than a Titian. Only two buyers had managed to recognize the work creating a stir that has since rocked the English art world. According to the auctioneer, the seller was a woman who had bought the painting in 1974. The buyer remains anonymous. The Guardian interviewed Simon Dickinson, a major art dealer in London, who stated that he was pretty sure of the work’s authenticity. Judging by the photograph, it might well be a painting dating from around 1510/1520, the same period as the Portrait of a Young Man owned by Lord Halifax, also up for sale at the moment at this same dealer’s, Dickinson (see News of July 12, 2007). The happy owner will now have to have the painting authenticated thus making it possible for it to pop up in the market one day at a much higher price than its sale price at auction, not to mention its initial estimate.